On today’s show Dan and Lizzie take your etiquette questions about accepting compliments about your dog, how to act as the NEW neighbors, wedding guests wanting to bring their own guests and whether or not to give a wedding gift when you contributed your skill to the wedding. 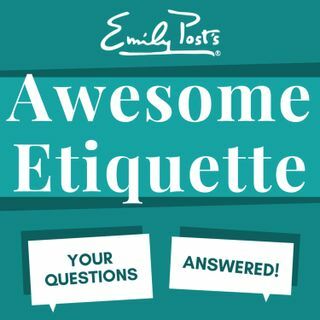 Plus your most excellent feedback, etiquette salute and part two of our postscript segment on the myth of how Emily’s Book Etiquette came to be! Awesome Etiquette Sustaining members, your extra question of the week is ... See More about not assuming you’re on the “B-List” for a wedding.